Following on from last week’s practice session, this week’s lesson was to compose our own still life incorporating cloth. I decided that oranges would look good on the green and white fabric. I also opted for a mixed media painting using Watercolours and Watercolour pencils. I need to finish it at home and once I have I’ll post it in the Mixed Media Paintings tab. This entry was posted in Blog Posts, Colour Mixing, Composition, Fruit, Mixed Media, Observation, Still Life on January 22, 2014 by Lea Sapsford. After doing 2 tonal drawings I decided it was time to do a large version in colour. I opted for Acrylics as I have finally got used to using them and now actually like them. My art teacher agreed with me that a restricted palette was the way to go. I chose Alizarin Crimson, Quinacridone Magenta, Orange, Black and White. I decided I wanted to do an abstract piece. The painting is posted under the Acrylics Painting tab. This entry was posted in Abstract, Acrylics, Still Life on December 4, 2013 by Lea Sapsford. I decided this week to use charcoal for my first A2 (16″x23″) composition. I really like working in charcoal it’s great for working on large pieces and it’s really messy and fun! For my mid tone I decided to use sandpaper to grate the charcoal against and then used a soft cloth and gently rubbed the charcoal into the paper. I then used charcoal sticks and charcoal pencils. I lifted out some of the charcoal with my putty rubber to create the highlights. I have posted my drawing under the Charcoal Drawings tab. This entry was posted in Charcoal, Composition, Still Life on November 20, 2013 by Lea Sapsford. This is the first day of the start of our project weeks. The criteria for the project is to use small objects (I’ve chosen buttons), do a drawing/painting maximum size of A5 (5″x7″) and then do another drawing/painting minimum size of A2 (16″x23″). I spent today working out the composition for my graphite drawing. I have decided I’m going to use A6 (4″x6″) paper and do a life-size drawing in graphite. I’ll post it under the Graphite Drawings tab once I’ve completed it. This entry was posted in Composition, Graphite, Still Life on November 13, 2013 by Lea Sapsford. Today was the first day of term and it was great to be back. This term’s lessons look really interesting and I can’t wait to get going. We started off as we always do with an observation session. 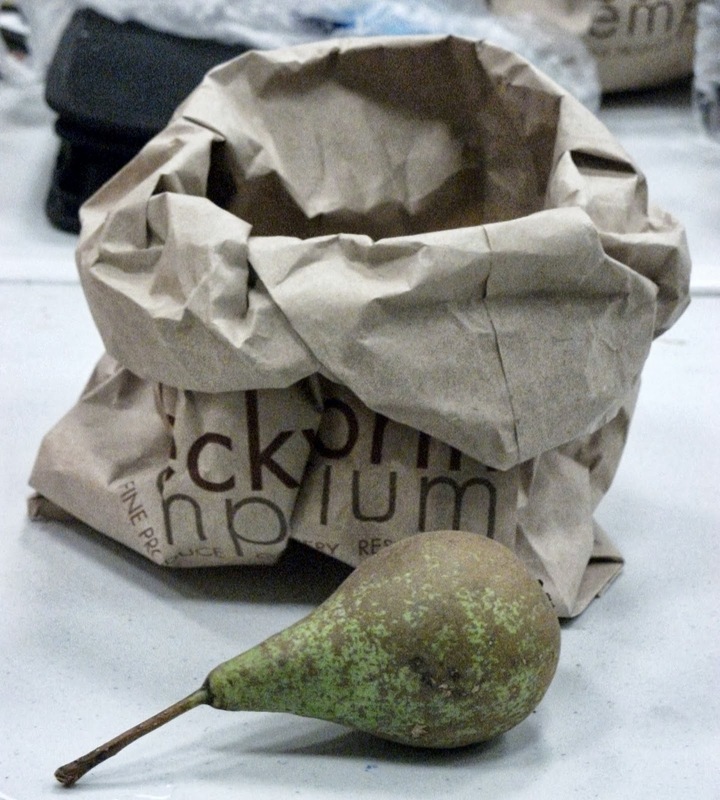 We could choose our own still life composition using a paper bag and a pear. We could choose to use either pencils, charcoal or soft pastels. I chose to use my new tinted charcoal pencils, black charcoal pencil, soft charcoal and white pastel pencil. I have posted my finished drawing under the Charcoal Drawings tab. This entry was posted in Charcoal, Still Life on September 27, 2013 by Lea Sapsford.